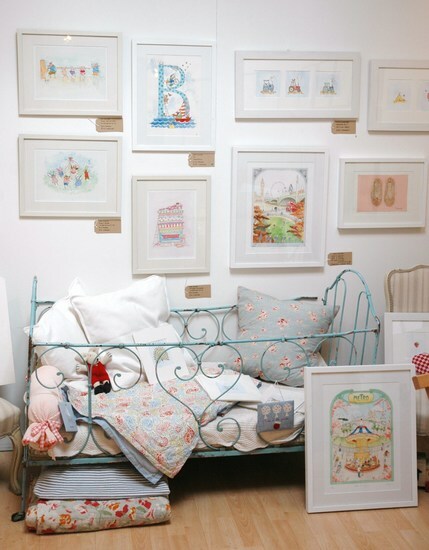 Kate Anniss Illustrations creates beautiful hand made art for children. Amongst our most popular works are children's names and letters as well as scenes from well known stories and nursery rhymes. Kate works in ink, watercolour and collage creating decorative, humerous and timeless artworks for children of all ages to enjoy. We also offer a wonderful range of prints, including A-Z of London - or Paris! A range of Fairies, Racing Cars or Knights in shining armour. Prints can also be personalised with hand written children's names or dates of birth to make a special present. These artworks are supplied mounted and wrapped. They are wonderful gifts for christenings, birthdays, Christmas, or to decorate your own child's nursery or playroom. A recent client comments: " I just wanted to thank you for the amazing 'O' you painted for baby Olivia. Apart from looking stunning in her bedroom it is also a constant source of enjoyment for our 4 year old, who loves to point out all the adorable animals and characters you have painted so beautifully. A thousand thanks."